Recent concerns over the possible effects of metal-on-metal orthopaedic implants and the evolution of more natural structures made from fibre have made medical device manufacturers consider the potential of fibre. Textiles offer the potential to replace traditional materials with novel fibres which are more suitable for many load bearing applications. Orthopaedics, in particular, is embracing textile technology for repairing, replacing, and regenerating integral pieces of the skeletal system and its associated components. This important new book will provide readers with a comprehensive overview of the role biomedical textiles can play in the orthopaedic field. 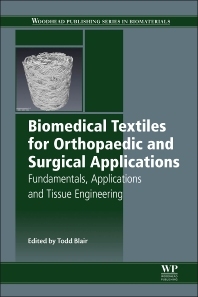 Chapters in part one will discuss the fundamentals of textiles for orthopaedic applications. Part two will cover textiles for implantable orthopaedic applications whilst the final set of chapters will discuss the role of textiles in orthopaedic tissue engineering. R&D managers in the biomaterials and biomedical textile industry; postgraduate students and academic researchers in biomaterials, particularly those concerned with orthopaedic and tendon and ligament tissue engineering.